While studying the works of Josef Albers, Puente developed a system of geometric abstract painting in which color serves, less as a formal expressive element, than as a visual language or syntax with meaning in itself. 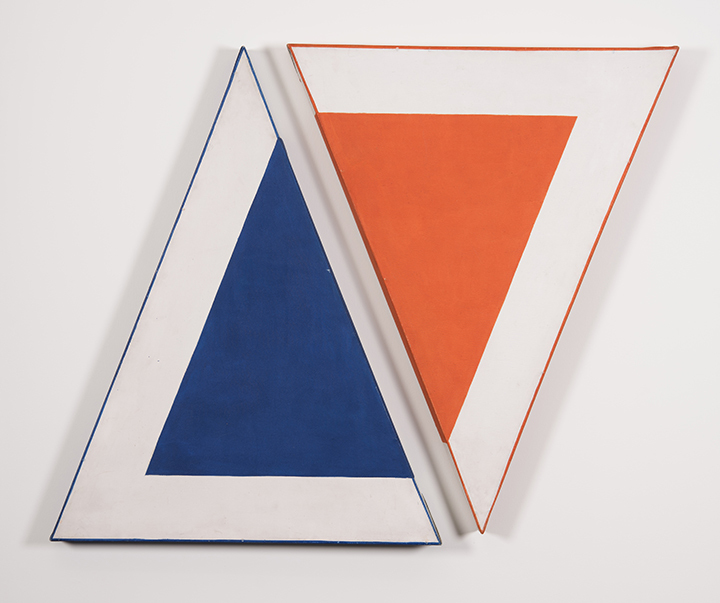 Having received a Guggenheim grant to travel to and live in New York in the late 1960s, Puente developed a new approach to Geometric Abstraction in which the viewer is invited to insert themselves into a three-dimensional structure and apprehend color and form in a sensorial way. Puente was instrumental in the transmission of avant-garde ideas about visual art between Brazil and New York City in the mid-20th century. Sistema (1967) evocatively captures Puente’s development from two- and three-dimensional work. In the painting, Puente expands the realm of the artwork to the negative space of the wall on which it hangs. Like his larger sculptural works, this smaller painting becomes sensorial insofar as it blurs the boundary between the edge of the work and the world around it. The canvas creates an environment of its own and yet has a substantial internal solidity emphasized by the thickness of the stretcher.